The phrase “short tracks, short tempers” is a classic in racing, and there isn’t a more perfect example of than a recent incident from Bowman Gray Stadium—a wreck for the lead, retaliation under caution, and a grand finale of two cars smacking each other in the infield. This, everyone, is as authentic as it gets. The angry game of bumper cars began when the No. 68 car of Robbie Brewer tapped into the back of leader John Holleman in the No. 4, sending him into a spin toward the outside wall. Brewer took off into the lead and the caution flag waved for Holleman, which allowed Holleman to catch back up to his opponent. 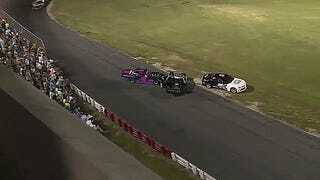 Directly behind the pace car, Holleman swings to the outside of Brewer and peels off his back bumper. Holleman then smacks into the outside of Brewer and turns him around, subsequently sending the pace car on a detour to get away from the drama. The following week, authorities arrested a competitor by the name of Joe Ryan Osborne for a violent altercation at Bowman Gray. Not all short tempers are the good kind, but the good kinds sure are good.